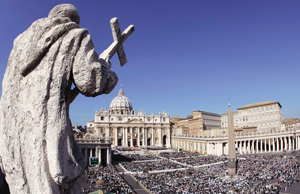 The Vatican’s International Theological Commission issued a new study on March 9 under the title “Theology Today: Perspectives, Principles and Criteria.” Like the commission’s 2008 study of natural law—still unavailable in an official English translation—it represents a forward-looking consensus view, in this case about the role of theology in the life of the church. It holds some real surprises. It offers a precedent-setting treatment of the sensus fidelium (i.e., the appreciation of the faith of the whole people of God), an exposition of reading the signs of the times that makes historicity a principle of contemporary theology and an evocative pointer to spiritual experience as a theological source. Developed in two phases over eight years, “Theology Today” was approved by the whole commission in November 2011 and released in March with the approval of Cardinal William Levada, prefect of the Congregation for the Doctrine of the Faith. Because the sensus fidelium is a locus of theologians’ study, “they must participate in the life of the church to be aware of it.” Because their intellectual work requires them “to critically examine expressions of popular piety, new movements of thought and movements within the church,” they are urged to work in a constructive spirit “with humility, respect and charity.” Furthermore, the body of the faithful, especially the laity and lay theologians, because they live on “the interface between the Gospel and everyday life,” have a special role to play in the church’s interpretation of the signs of the times. Thus dialogue with the world is a distinguishing characteristic of theology today. In treating Christians’ shared reading of the signs of the times, the commission takes special notice not just of the turn to historical consciousness in theology, but to the historicity of the entire tradition, underscored by thumbnail histories of theology, especially in the modern period. “Theology Today” offers a tantalizing glimpse, too, of spiritual experience as a source for theology. Theology, the commission argues, is not just a science; it is also a form of wisdom, seeking unity in its knowledge and intimate personal union with the mystery of God. Thus, scholarly theology and mystical theology are complementary. The new study, however, fails to explore both the mystic doctors of the church—like Bernard, Catherine of Siena, John of the Cross and the two Teresas (Ávila and Lisieux)—and the great theological studies of mystics by Von Hügel and Brémond. Nonetheless, the commission’s identification of spiritual experience as theological source does suggest it may be time for others to resume the work of those pioneering scholars. This article also appeared in print, under the headline "Commission Text Holds Surprises On the Role of the Faithful," in the April 2, 2012 issue.